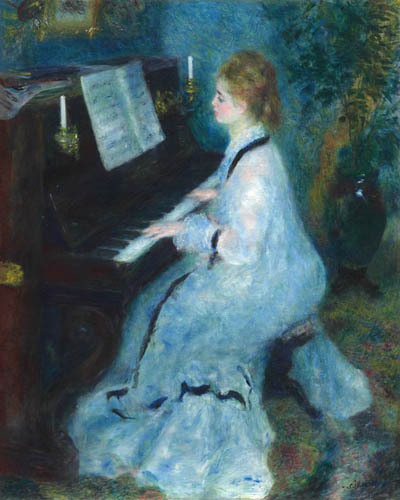 This is a good time to visit the Art Institute of Chicago because you won’t have to even glance at Renoir’s “Woman at the Piano” as you pass through the Impressionist Gallery just off the staircase. Lifeless, insipid. Notice the pink hands on the piano keys, no energy there at all. They look wilted and dead, like something shredded and overcooked. Flounder? Flop, drip, melt. I can’t relate to this tired image at all, except to learn from it’s failure. 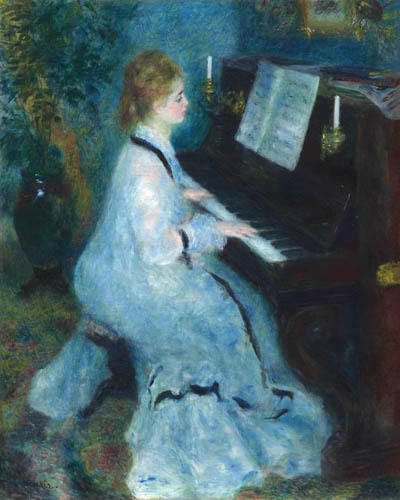 I’ve made an effort to see it as a plea on Renoir’s part to let women out of the house once in a while—it was painted in 1875, when respectable women, the kind who would have a piano in the house, were actually encouraged to stay inside as much as possible and if they had to leave, to take a parasol as protection against the sun, that awful bright daylight. 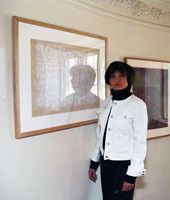 This is the first post on the topic of taking time to look at art you don’t like, first mentioned in post 2.23.13. Next, I’ll flip this boring and bored woman left-right in the hope of finding something there.